VAT compensation schemes considered as illegal State aid in the public sector context. The book concludes with an insightful discussion of what might be considered as ‘best practice’ in relation to both the exclusion and full tax models. 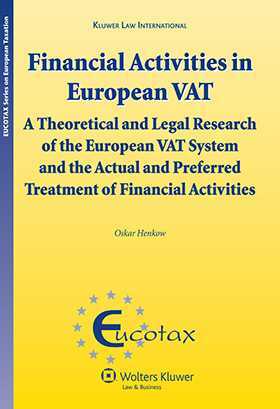 Peerless in its thorough discussion of the treatment of public bodies in various VAT systems, and in the EU VAT system in particular, this study will be warmly welcomed by practitioners, academics, and policymakers as a giant step. 2. The financial sector, money and interest. 3. Consumption and financial activities. 4. The exemptions for financial services. 9. Chargeable event and chargeability of VAT. 11. Deduction of input VAT. 12. Possible treatments of financial services. 13. Final remarks and future reforms.